Prac Take 2. And what I’ll focus on. So it’s time for my second teaching rounds and I got to meet my first class. Let’s make a list, I love lists. These are the things I will be focusing on this time around. having a structure in my lessons. A CLEAR start, middle and end. This was a HUGE problem last time around and honestly I really regret it. There is nothing worse than a teacher that is running around fumbling trying to finish off the lesson. Aside from seeming unprofessional, it also suggests that your content isn’t so important cause you can quickly rush through it. Differentiating my instruction. I will have a lot of group work and I’m going to try to organise groups based on learning styles and ability. This is because many of my classes have a huge varying range of abilities and it’s clear that some students need extra support, for example they are just transitioning to this school from an intensive English school. While on the other hand, in the same class, I have students who are so obviously beyond this content and really require more nurturing. My supervising teacher already does this in the form of different tasks but I feel like I could be more useful if I did it during class time. focusing on OPEN ENDED questioning! And allowing students response time. This is going to be my strategy: (1) ask an open ended question (2) allow students to respond in their books (so I must pick these questions carefully, because they are going to form the basis of their notes for that lesson). (3) pick a students’ name randomly to share (I’m going to do this with double sided paddle pop sticks that I stole from here). 1. Alice Leung: Excellent blog by an Australian educator. Alice teaches science and maths and her education philosophies are modern, exciting and innovative. 1. The Cell Blog: Artist Lukas Wossagk creates original and hilarious content on biology. 1. Blendspace: Allows you to curate resources and then share it as a package with your students. Allows collaboration amongst your students and allows you to ask questions of your students. Basically my favourite way to organise lessons to share with my students. 2. Pinterest: One of the best ways to find new content on the internet. I see it as a curated Google because it’s what other people find interesting so basically it sifts through all the low quality material and gives you the creme of the crop. 1. Google Drive: THE best way to collaborate online. Allows you and your students to share work and be constantly up to date. Allows you to upload from within the site and share with people you want to collaborate with either as a View Only option or an Edit option. 2. Brainscape: Creating flash cards in an easy to use platform. Also has a neat feature to “remember” which you got correct and which you got incorrect and retest you on those you aren’t sure of. 3. Curriculet: A way to annotate passages of text. This would be fantastic in class when we are reading a new bit of information and it’s got a lot of new terms in it. Students can comment and ask questions on the text. 1. Spicy Nodes: Absolutely stunning way to create mind maps. Students can collaborate on them and add images and websites. 2. Venngage: Creating infographics! So gorgeous. So easy. The only downside to this site is you can’t export it to a PDF unless you upgrade your account but you can still view them online. 3. Podomatic: Creating audio podcasts online. Students will love using this platform as a different method of submitting assignments. Students need to create the audio file on their devices and share them using this site. 4. Make beliefs comix: Creating comic strips using templates has never been easier. The graphics are great and students can add speech. I can’t wait to use these. 5. Label59: Allows you to add labels to diagrams. 6. Edpuzzle: Allows you to edit, crop, add audio, add quizzes and totally transform videos either found online or that you’ve uploaded to the site. Totally flipped classroom worthy. 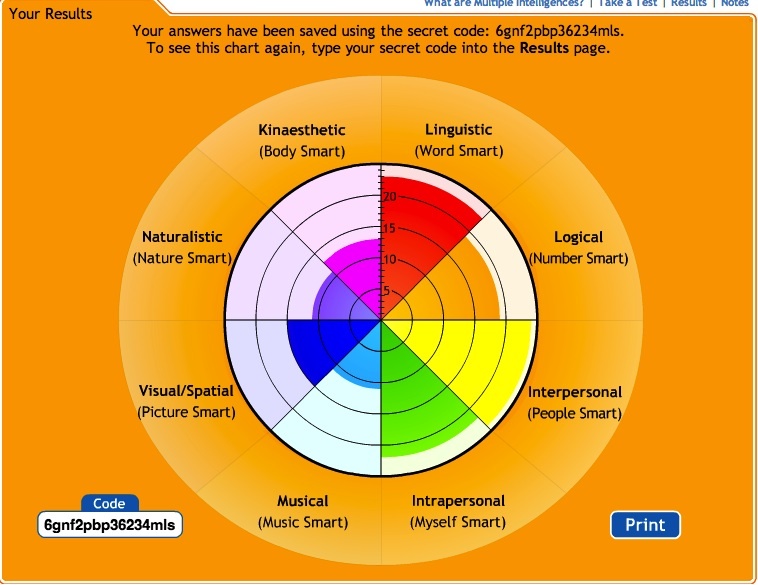 This is my own multiple intelligences chart. We’ve been told numerous times (and I’m sure that you will agree from your own personal experience) that rapport with your students is one of the most important things to build in a classroom. So many issues that arise in class that relate to classroom management stem directly from a poor teacher-student relationship. We have to know them! We have to know what they like or don’t like. How they learn. What their learning background is. So how the heck can we learn all of that while on Practicum? We have basically less than a week get to know our students. I used this get to know you template. But I’ve tweaked it to suit my needs. Some of my students were quite offended about the Mothers occupation and Fathers occupation section so I’ve removed that and some other generic questions and tried to target questions that really tell me how my students are as learners. To make the task less daunting I volunteered information on myself. In the updated version I’ve also added the Gardners Multiple Intelligence quiz and fill-in-the blank scaffold. It is my intention to use this template in my upcoming Practicum in order to facilitate group work. Students will be assigned particular roles in groups that align with their preferred intelligences. In a survey I had my Practicum 1 students complete 78% of them said they understood the purpose of the activity and most said that it was a positive way to get to know them. One student commented that she would have liked to get to know her usual classroom teacher in this way also! This task allowed me to build a rapport with students who were then more comfortable with me as they knew I was trying my best to treat them as individuals (Buskist & Saville, 2001). You can download a PDF version here. or if you’d like to tweak it yourself: Here’s a Word Document. What my students say about me. 1) Did you feel like you knew the purpose of the Facebook get to know you activity? 2) Do you feel like I challenge you enough in class? 3) Do you feel like you can ask me questions in class? 4) Do you feel like I explain things well? 5) Do you feel like you learn in my classes? 6) Do you feel like the class environment is well managed? 7) Do you feel like I give you enough feedback on whether you are achieving the learning outcomes of my lessons? 8) What do I do in class that you like? Or what would you like to see What do I do in class that you don’t like?more of? 9) What do I do in class that you don’t like? You can view the results of the survey. I don’t challenge my students enough. They feel like I’m just cruising them through on the bare minimum that they need to know. This has a lot to do with my inexperience at differentiating lessons. I don’t go into enough depth with the content sometimes. I explain concepts well but sometimes I go too fast. Using different methods to get my point across e.g. videos helps my students to understand better. The use of analogies was very helpful in explaining difficult concepts. I try to explain things a number of times to ensure that my students understand. Students need more guidance as to what to write down. I don’t give my students nearly enough feedback on whether they are achieving learning outcomes. Students overall liked: animated descriptions, humour in class, mini-whiteboards, videos, class discussions, guided note taking, practicals, fun facts, the questioning methods I use. Students didn’t like: comprehension worksheets, that I didn’t challenge them enough, when I explained things too quickly, too much information, not revising previous lesson or outlining learning goals. This here is Stanley Miller. When you tell stories in science and make it relevant to students they remember it better. Let’s take this example of the story of Urey and Miller and how their revolutionary experiments have impacted our ideas on the origin of life on Earth. So the first thing you should know is that the Earth is really old. Really really old. It’s 4.5 billion years old. But how old is that? I don’t know! So let’s do something else. If we imagine that the whole time that Earth has been around to be 24 hours. Then we can work with a timescale that we’re a little more familiar with. Ready to join me? Okay. So at 0:00 the Earth just formed. Nothing much else happens till 4pm. Bacteria are just hanging out there. Making the world oxic. 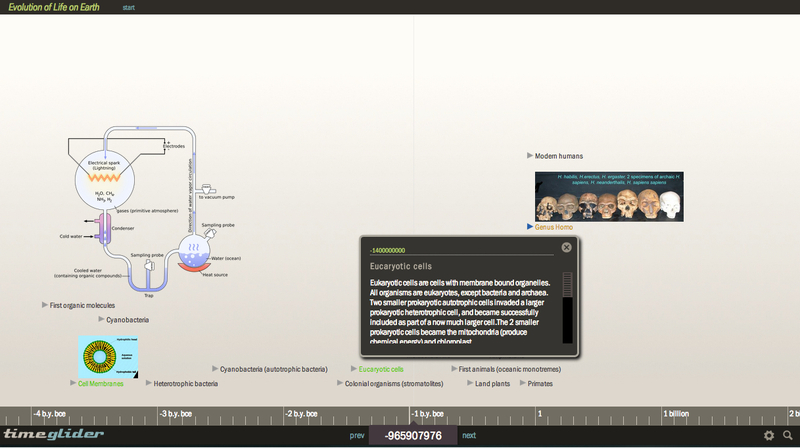 At 4pm eukaryotic life appears. These are organelle bound remember. Again, nothing much happens until 9:45pm where insects appear. All of recorded history lasts only 0.03 of a second. Mind = blown. That’s pretty incredible isn’t it? What did they think Early Earth was like? Now introducing another two guys. Harold Urey and his slave graduate student Stanley Miller. 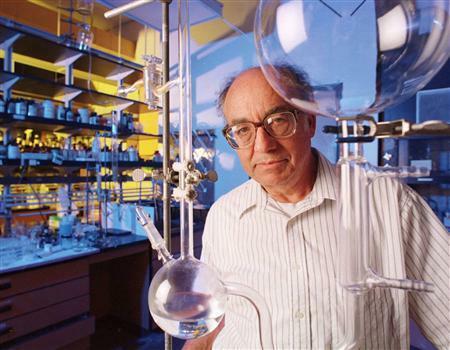 Mr. Urey says “Hmmm I wonder if I set up an experiment with all those conditions, would it give rise to those biomolecules? If only I had a grad student to do all this research for me….Oh Stanley!!! !” And Stanley of course says “Yes Boss”. If you’d like to see a set up of their experiment this site has a fantastic video to explain it. In my powerpoint I have a whole series of other useful questions to ask of your students regarding the Nature of Science. When is this event occurring (provide the best estimates of time period)? Describe the event that you are researching. Outline key features of the event. Provide references for your research. What evidence (such as fossils where possible) do scientists use to describe this event? Include images/video. How does this event contribute to the diversity in the evolution of life on Earth? I.e. what implications does this event have on future life on Earth? I then asked my students to peer assess another groups summaries against the same above criteria and fix up any suggestions that the other group made on their own summaries. Finally this edited version was to be uploaded onto a class timeline generated on Timeglider. I’m not sure this was the best Web2.0 tool to use for this purpose. It didn’t allow collobration between members so basically we all used the same login and password to create this timeline. In future I would like to look for another tool that allows each pair of students to create an account and then they upload their work from this source. It would aid in me keeping track of who’s submitted their work and who hasn’t. My class’ timeline can be found here.